Two saucers, two vases and a new marble. I like the colors but it really isn’t a work of art – just two saucers, two vases and a marble glued together. 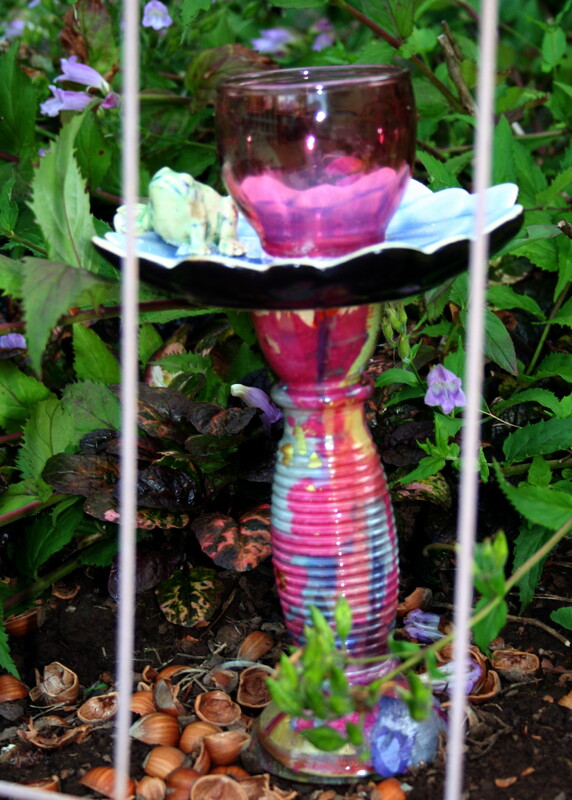 A tie-dye vase with a leaf-shaped saucer, a votive holder and a ceramic frog… Tie-dye garden flower! I like this one. I should have angled the camera so you could see the leaf-shaped saucer and the frog a little better. It is hiding in the penstemmon. Willy Wonka tea cup flowers! They aren’t yellow daffodils but they were such a perfect find at Goodwill! 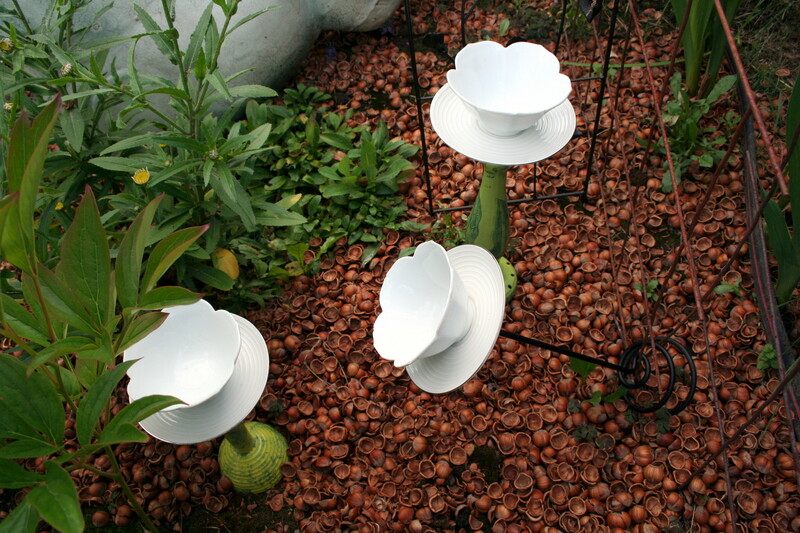 Three little flower-shaped white porcelain cups, 3 saucers (from Pier One according to the label on the bottom) and three funky and very different stems. These are my favorites. 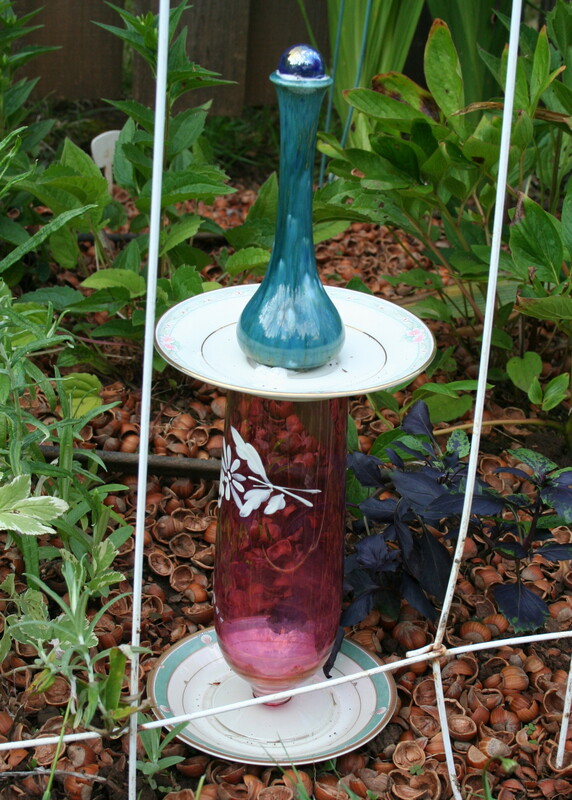 Of course all yard art will have to come in when winter sets in but how fun to have a bit of whimsy in the garden! THIS is what I have been spending a lot of time on. This is the underside of the glass top to my outdoor magazine rack. I used craft paint. According to my online research it is the recommended medium for outdoor window painting. Surprised me but then it is what I used before and the previous painting lasted several years and was still a bear to scrape off when I decided it needed a new painting this summer. The “right” side of the glass. 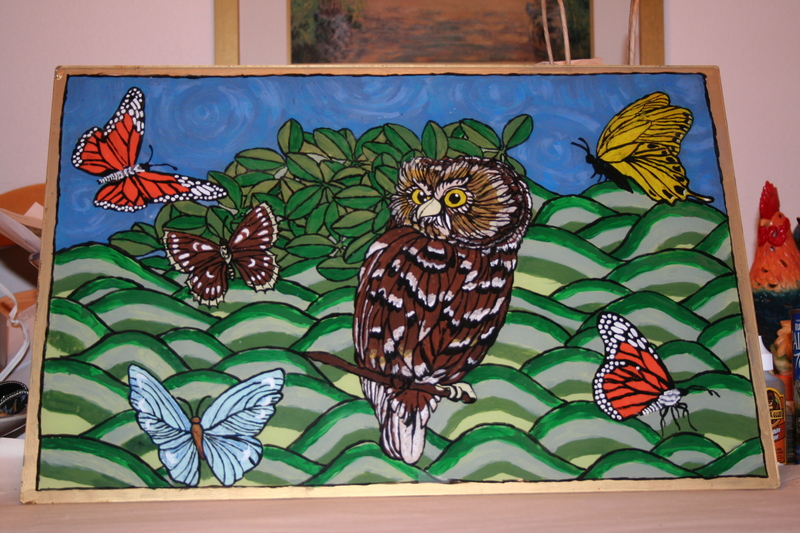 I should have painted more orange on the two butterflies, but I took artistic license with the whole design anyway, so who cares? 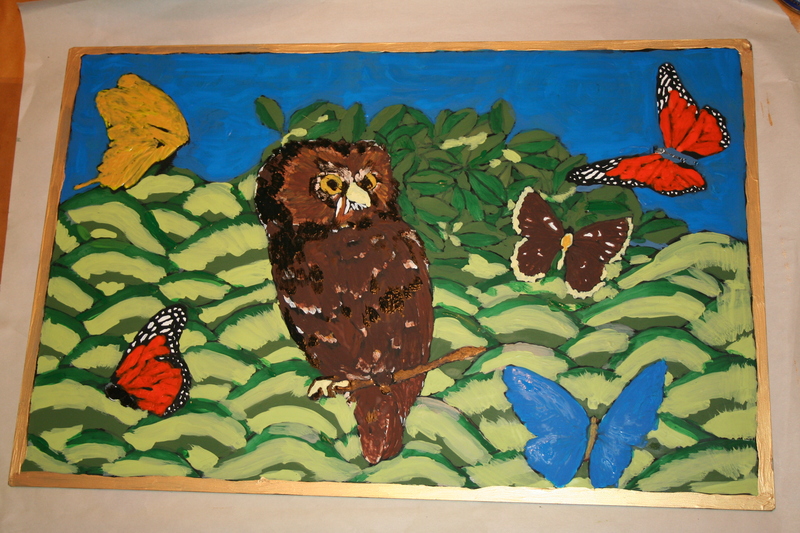 The butterflies & owl are courtesy Dover Books. I love their copy-right free stuff. In place in my garden. The magazine rack was one of those little brass ones. My boss decided to throw it away because it didn’t match any of the office decor (he was right about it not matching anything) but I couldn’t bear to see it reduced to scrap metal. I brought it home and my husband nearly croaked. Not in his house, he said. “I have no intention of bringing it INSIDE the house,” I retorted. And then I painted it flat black and painted the glass top. 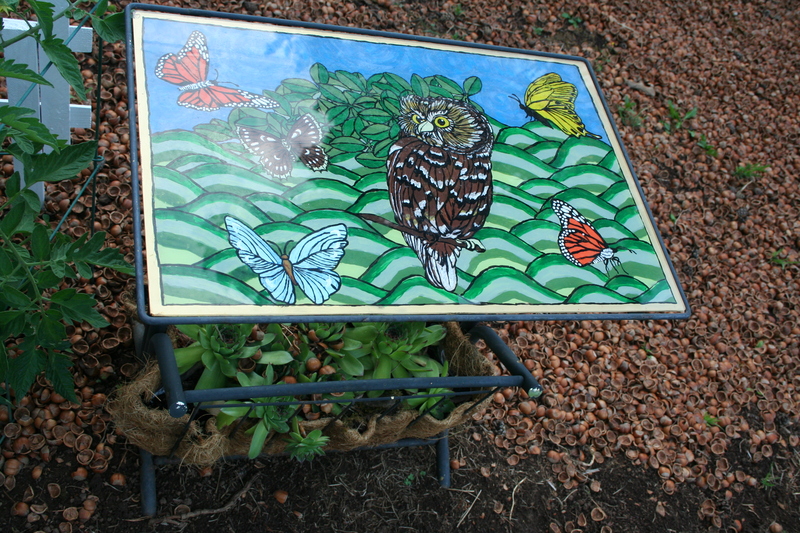 Since then I have added the hens and chicks and the new painting on the glass top. I love it. jaci, I really, really love garden structures. Despiste what Jerry and Don say, I love having pieces of furniture “growing” with the flowers/shurbs. and your tiedye flower is wonderful. The teacup clump is perfect, like a clump of shasta daisies. Your garden comes the closest to the cottage garden I will never have. Sigh, why did I marry such a neat freak! Gorilla glue will hold anything! I love it. I would recommend a 5 min waterproof two part epoxy. I use it with my stone cast yard statues. If you have a chance please check them out on my facebook, keyword chic-e-tiki.